Where is the real report on the Belfer Center’s Wikipedia program? For those seeking more context for this blog post, I recommend this summary by William Beutler. Last week, Sue Gardner of the Wikimedia Foundation (WMF) reported on WMF’s role in placing a paid Wikipedia writer (“Wikipedian in Residence” or “WIR”) at Harvard’s Belfer Center, paid for by the Stanton Foundation. Gardner’s report acknowledges that WMF was negligent; but based on my substantial and direct contact with the program – before, during, and after its execution, as described here – I consider that conclusion insufficient. The WMF knew that its actions were mistakes before it made them – and then it made them anyway. This program should have been approached in a way that supported the Wikimedia vision, and the ethical principles articulated by Wikipedia’s editorial community (e.g. here and here) from the beginning. Wikimedia personnel knew the importance of this principle, but did not act on it. The problems of the program went far beyond mere negligence. 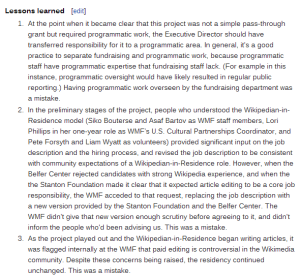 The WMF willfully disregarded best practices for engaging with Wikipedia – which is supposed to be one of its core competencies. I think we deserve a thorough explanation of how and why that happened, and so far, we don’t have one. Gardner identifies a point that necessitated a different course of action, but she doesn’t state exactly when that point was. Let me fill in that gap: that point was at the very beginning – that is, before Gardner, as Executive Director, assigned responsibility to the Revenue department. That much should be clear to those readers who have a general familiarity with WMF and its approach to fund-raising and programs. No pass-through grant, to fund a kind of program (WIR) that WMF has consistently refused to directly fund since at least 2010, should ever have been viewed as “simple,” or appropriate for execution by fund-raising staff. 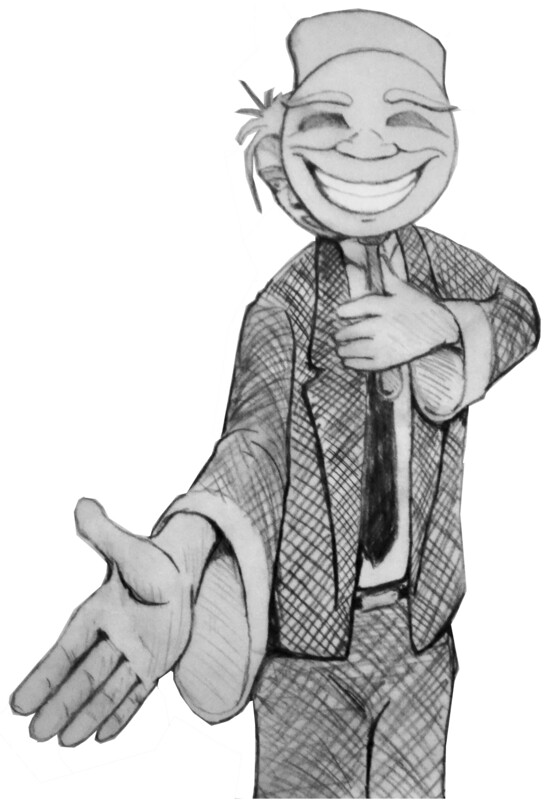 You should talk to Pete about the Wikipedian in Residence position the Stanton Foundation wants us to put together. In short, the programmatic significance of the project was understood by Gardner and Gruwell many months before the job description was posted; it was not a revelation that came through part-way through the project. …when the the Stanton Foundation made it clear that it expected article editing to be a core job responsibility, the WMF acceded to that request, replacing the job description with a new version provided by the Stanton Foundation and the Belfer Center. The WMF didn’t give that new version enough scrutiny before agreeing to it, and didn’t inform the people who’d been advising us. This was a mistake. What Gardner says in Lesson 2 is factually correct, but a reader might get the impression that the mistake was a mere oversight – that a couple of stray comments from volunteers, perhaps, got lost in the shuffle. Such an impression would be wildly inaccurate. The guidance that I, Liam Wyatt, Lori Byrd-Phillips, and Wikimedia staff provided was thorough, and it was clearly communicated through proper channels. I completely understand your concerns about paid editing and the [sic] is not an attempt at it. Now, we learn from Gardner’s report that Stanton and Belfer later insisted on explicitly restoring the paid editing component of the program. Gruwell did not run that change by Wyatt, myself, or (apparently) anybody with relevant qualifications. Because of the extensive discussion devoted to precisely this point, I do not believe this could have been a simple oversight. It had to be a considered decision to keep that information from us. I do not have any further insights into why that decision was made; but referring to that decision as a “mistake” in the report fails to capture the nature of the decision in a credible way. I believe it is too early to draw conclusions about the Belfer Center’s Wikipedian in Residence program, or the Wikimedia Foundation’s role in it. WMF personnel did the wrong things, and the organization has conceded that much. Good. But they also did so with a level of disregard for the consequences that, to me, appears reckless. Reckless disregard for the future of Wikipedia, this thing we have all worked so hard to build, this thing we all believe in so passionately. And we haven’t yet heard why. Some have speculated that there was a deliberate attempt to subvert Wikipedia’s ethical principles as a special favor to an important funder. I am highly confident that is not the case, based on my personal experience with the various people involved. Not just based on my personal experiences, though – I also believe the relative scale of the program belies the “corruption” story. If a foundation with assets in the hundreds of millions were to do something intentionally subversive, it would do so at a scale far greater than $50,000; and it would do more than add a few hundred words to each of a dozen Wikipedia articles. But in the absence of a thorough and credible explanation from the organizations involved, I think it may be inevitable for those who care about Wikipedia and its future to engage in this kind of damaging speculation. Thus far, the WMF has not given Wikipedia’s stakeholders (including readers, organizations contemplating a WIR, and Wikipedia volunteers) a clear and thorough account of what happened, and why the significant decisions were made. What were the goals that drove the WMF to dedicate staff time to this project, and attach its valuable trademarks to the job posting? How did the goals relate to the movement’s five year strategic plan? Were the goals accomplished? What unanticipated results occurred? Overall, what were the effects on the quality of Wikipedia? on the strength of the Wikipedia brand among the people and organizations who share our vision, which supports Wikipedia’s increasing reach? on the health of the Wikipedia community – will this increase participation? And in this case – what is the impact on the effectiveness of the Wikimedia Foundation, an organization whose central purpose is to support the work of a huge and deeply passionate community? These are the kinds of questions the Wikimedia Foundation rightly expects its grantees, program staff, and chapter organizations to consider. But they have not been addressed in the Wikimedia Foundation’s own report of the Belfer Center Wikipedian in Residence program.